Just over two years ago I attended a conference held in Nunavut. Authorities from across the North discussed various factors affecting education in the Arctic, with one of the most pressing being the lack of suitable Inuit-related teaching resources. Since that time, Inhabit Media, an Iqaluit publishing house, has taken concrete steps towards addressing this issue. Its book list includes nearly three dozen items at the secondary and elementary grade levels, with fourteen accompanied by teacher study guides that include lesson plan ideas which can be downloaded via pdf. The Raven and the Loon is a new addition to their offerings. This handsomely illustrated work provides one explanation of how and why loons and ravens look the way they do. This folk story is a good one, and it contains elements that directly derive from the region (such as an iglu, a stone lamp and the ever-present Arctic landscape) and are central to the plot. Aimed at readers in the 4 to 6 age bracket, the 32 page work is available in both English (hardcover) and Inuktitut (soft cover). 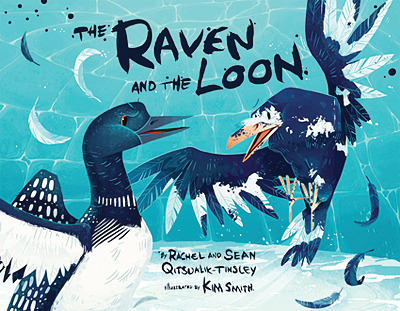 Classroom Connections: The Raven and the Loon tells a story that revolves around patience, personality conflicts and creativity. It could be used as a jumping off point for discussions about getting along with others, as well as a model for primary students to create their own folk story of how an animal they are familiar with came to look and act the way it does.